The thoughts about a patron saint for Europe was resurrected about six years ago.Saint Birgitta was an obvious participant. She was a woman, she was very successful and she was from Scandinavia. The Birgitta nuns in Rome have worked very hard to get Birgitta elected a patron saint. Now and then, Europe was split and confused. As always, Saint Birgitta has a quest to fulfill, at least that is what mother Tekla says, who is a general abbess in Rome. In 1999, the Pope appointed Saint Birgitta one of the patrons of Europe. 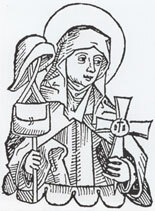 Mother Tekla believes that Birgitta would be happy and flattered to be one of the patron saints of Europe. - This is the least Europeans of our days can do to show our gratitude, she says. Woodcarving in Hartmann Schedel´s "Chronicorum liber" printed in Nürnberg 1493.